Well it's been a long time from my last blog. I've been very busy with my family and rod building. The rods have been really selling well. I've been selling a lot in the UK and sold one to a nice guy in Sweden. I did get to go down to Roaring River and do some fishing and meet up with the Sobers. Used the Killer Worm and had a lot of fun. Got to spend some time talking with Ron and John and Michael. Good people! The river had a lot of water in it and was a little stain to it. The number of fish in the river was down but still not bad. I'm heading down with the family this month for a weekend and really looking forward to it. My brothers brother in law caught a nice 4lb+ fish last weekend. He caught it on a ultra light rod. Boo! I made him a fly rod?? I'll try and keep my blog updated better. But when there's rods to build I'm building!! Tight lines!!! I went down to Tanycomo Friday morning to meet a new friend. Gary Harrison met me in the parking lot to get his new rod. Enjoyed meeting Gary and getting to know him. Very nice guy. I hit the water about 9:00 and 0 units!!! First time I've been able to fish the river in day light. It's changed some but still the best place around to fish!! Started with a egg pattern. Nothing! The next 4 tie ons Nothing! The Killer worm was next! First cast "HELLO" nice 17" fish and the Dam horn starts blowing!!!! Many nasty four letter words ran threw my mind and none of them "fish". Then the horn blows again!! 2 units! Just when I figure out what they want!!! The water started coming up and a third horn blows!!!!!!! Everyone started for the north bank. A weard thing happend!! The water started dropping and went back down to normal???? I didn't care what was going on I wanted to fish and I did! Caught fish everywhere I went. Had a ball!!! Caught about 15 fish in a hour and a half! The river was wonderful to feel again on my waders. I talked to 4 or 5 very nice people. I'm going to have to take a morning off and head down sometime soon!!! The rods have been selling very well as of late. Hope it continues! Well I got to go hiking the first week in June in Colorado. We went to the Lost Creek Wilderness area. It was a great time!! We did get to do some Brook Trout fishing but the stream was up and dirty from several days of rain. We had a blast with everything from hiking and finding fire wood to day hiking up farther in the mountains. The mornings were cold. I had ice on my tent about every morning but it didn't take long to warm up and dry out. There were eight of us that went. Great bunch of guys!! Well I got a real kick in the teeth this week. My rod blanks supplier said that I ran him out of the 6'6" 4pc 2wt blanks!!! I've been selling a ton of them but I never thought that would happen. He's got them ordered and he's also ordered a bunch in matt black finish also. I don't know how long it will take to get them but I'm crossing my fingers that I will be soon! I feel I'm missing a lot of sales!! I've got 18 days till I go hiking in Colorado!!! I've got my Gregory backpack and sleeping bag and tent and everything but food ready to go already!! I'm pumped!! Look out brookies Murdoc's coming!!! Tight Lines!!!!! Give your kids a hug today!!! Smile and keep them wondering what your up too!!! Well it's been a great year so far for rod sales. I've been very busy and getting busier. I shipped 10 rods last week and I'm going to ship 4 this week and I took 3 rod orders last night and forsee more this week. I really appreciate everyones orders. I pray everyone is happy with my work. I hope to open a market in the UK if Dave and I can get everything worked out. He's a true fly fishermen!! I'm going to take him up someday and go fishing in England. That would be sweet!!!! Keep fishing and keep living!!! Michelle and I dropped the girls off at Celia's and took off for Taneycomo. Well it was Friday the 13th and the corp was running water when they said they wouldn't be!!! So it was off to the Landing for some grub!! Famious Dave's was on my mind!!! GREAT LUNCH!!! After we were done we were walking out and I called the Dam. Zero units!!!!! We were off and running. I dropped Michelle off at Tanger and I was speeding to the dam. I haven't seen the river behind the dam for a long time! It has changed a lot. The whole thing seems shallower. I tied on a scud and caught a few fish and then changed to the Killer Worm! I was able to do some site fishing and did manage to catch about 15 fish. I lost two nice ones. Just didn't get the hook in them. The horns started blowing at 4:45 and here the water came! Time to leave and get my sweetheart and head home. All in all I had a great day! Good company, Good food and trout fishing!!! It doesn't get much better than that!!! Rods are still selling good! Get your order in!! I had to run down to Tims on Wed to pick up a reel so I spent a couple hours on the River. I was very suprised to see how empty the river was of trout. 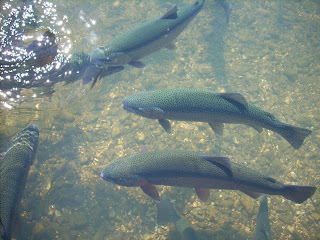 It was just 4 day sence opening day and there wasn't hardly any trout in the river. I fished down below in the fly area and did manage to catch about 15 fish in a couple hours and enjoyed the catching as well as the weather. Man was it nice!!! My tag number was 2826. They said they turned loose 7200 fish and there had to be at least 3000 fish from Catch and Release season so there's a lot of fish missing some where!! It was nice to go fishing for a while and I enjoyed my company also. Michelle read a book and I think napped some also! We had a great outing!! I'm about to get caught up on my rod building. I've built 13 in the last 2 weeks!! I'm a tired boy!! My trip to Taney went great. I got down about 1:00. They were running one unit so waiding was really out. I got a place by #2 outlet and gave it a shot. I caught about 15 fish till 3:00. I caught one cutthrout that was about 18inches. Hard fighter and beautiful fish. They fight a ton better on Taney than Roaring River. I'm going to head down to Roaring River on Wed to get a reel from Tim at Tim's Fly shop. Great place to stop and get all the scoop!! I'll report after the trip. I'm going to fish a little. Michelle is going with me maybe I'll get some pictures to post. I'm selling rods like crazy right now. Great start to the year!!!! Remember you can comment on the blog. Thanks!!!! Haven't posted in a while. I've been busy building rod!!! They are going fast!! I'm working on 9 right now. I haven't even been able to go fishing! I'm going down to Taneycomo this friday! Yea!!! I'll post again after my trip. Got to go down Saturday morning. Beautiful day!!! The rains have helped the river alot. Nice flow. Fishing was great. Got to meet Josh from Springdale AR. He landed this pretty female. 8 1/2lbs. She was full of eggs. If you look at the picture close you can see she's aborting her eggs. Turned her loose and she did great. There's a lot of nice fish in the river. Looks like some are new to the river. They turned loose a bunch of browns last week sometime. Not big browns but nice fights. I didn't stay very long but did manage to catch a few. It was nice to get out and fish!